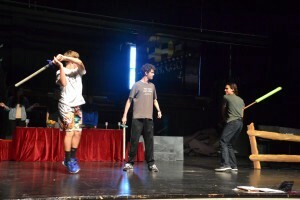 This week, Haddonfield Memorial High School’s auditorium will be transformed into a magical fairy tale realm with princes, princesses, sword fights and magic for the drama club’s fall production. HMHS’s fall drama will have two fairy tale performances with “Cinderella Wore Combat Boots” and “Beauty and the Beast.” The performances will be held on Thursday, Oct. 22 at 7:30 p.m. and Saturday, Oct. 24 at 2 p.m. and 7:30 p.m. in the HMHS auditorium. Tickets are $8 for adults and $6 for children 12 and under. “These plays definitely have something for everyone — they are entertaining for all ages. Please bring your children, grandchildren, neighbor children, your friends and spouses — everyone will love these plays,” fall drama director Heather Vaughn said. These classic fairy tales are stories everyone knows, or at least thinks they do. HMHS’ plays, however, aren’t Disney’s versions of the stories. Instead, they are a slightly different retelling of the popular tales. “Beauty and the Beast” is the tale of a stubborn and selfish prince who is cursed and turns into a beast until someone loves him for who he is. It is a love story that includes magic, a sword fight, talking furniture, drama and comedy. “Cinderella Wore Combat Boots” is a comedic one-act version of the familiar tale of Cinderella and her stepfamily, her trip to the ball in a pumpkin-turned-carriage and the prince who falls in love with her simple, fun and good-natured personality. Other than the slightly different stories, HMHS’ fall production will stand out from others with special effects, incidental music, great costuming, choreographed swordplay and the addition of one Haddonfield Middle School student and one Haddonfield elementary school student. “I hope during ‘Beauty and the Beast’ (the audience) gets to relax and enjoy this tale that is so well known and see all the cool costumes, actors and talent. In ‘Cinderella,’ “I really hope they can laugh and I really hope they participate with all of the audience participation things. 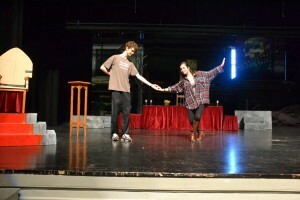 And just enjoy,” said sophomore Riley Crompton, who plays the Story Teller and Madame Rondeau. Each play also has a lesson to teach the audience. Vaugh believes “Beauty and the Beast” can teach the audience to treat others as you would like to be treated and love and care for those in need. For “Cinderella Wore Combat Boots,” the message for her is those who dish out kindness while expecting nothing in return are often better off in the end. Junior JT Tully, who plays the Prince in “Cinderella Wore Combat Boots” and Greedo in “Beauty and the Beast,” believes forgiveness, and not to be selfish or greedy, is an important lesson to learn from “Beauty and the Beast,” while junior Joanna Moles, playing Beauty, believes the audience can take away that selfishness gets you nowhere and in the end true love and caring for others gets you far. For “Cinderella Wore Combat Boots,” Tully believes audiences can learn fairness and hard work will get you a lot more in life than passing work on to others. Vaughn would love for Haddonfield’s youngsters to come to the play and enjoy live theater. “‘Beauty and the Beast’ is a show for everyone. You have comedy; you have drama; there is romance; there is fighting; so I know for a family there is something for everyone,” Tully said. Tickets are available at door or main office of the high school, located at 401 Kings Highway East.